I have been thinking a lot about vocation and calling recently. There is so much to say. But for now I want to concentrate on some words that really touched me a few years ago and the key truth that I think they express beautifully. 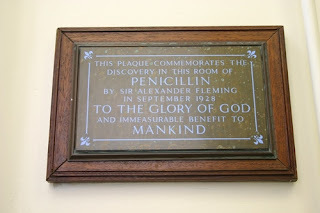 In 1928, in St Mary's Hospital in London, Alexander Flemming discovered Penicillin. It is difficult to overstate the significance of this or the effect it has had on the world in the past 84 years. This plaque sits just outside the laboratory where Flemming worked. When I visited the lab I noticed it and asked the guide about it. He told me this was put up in Flemming's lifetime and he approved of the wording. Very few of us will have as dramatic effect on the world as Flemming did. But whatever we do, I believe if we do it for the glory of God and for the benefit of the people who's lives we touch then we are very much living out a vocation. I also think that if you haven't found your calling yet, working in this way in the meantime means that whatever you actually do, it can be of immense value. In my life I have taken a large number of exams. One of the cardinal rules of exams is that you must answer the question asked and not a different one that you want to answer. However when speaking or writing it is often a useful device to answer a different question. So I want to start by asking Is God A Surgeon? It's easy to tell the difference between God and a surgeon - God has no illusions about being a surgeon. In his excellent book on medical ethics, John Wyatt presents the analogy of the human person as a masterpiece made by God and the role of the doctor is to restore this masterpiece. For me surgery can be quite humbling. When we repair bowel or a blood vessel, it is the body's own healing processes that does most of the work. When we 'fix' what's wrong with the body, it is evident to me that my restoration work is rarely - if ever - up to the standard of the original. Surgical solutions are certainly very good but surgery is still a relatively crude instrument. This kind of thinking does beg a question; If God's masterpiece is so wonderful why do we have disease and (particularly) congenital anomalies requiring surgical correction? For me, the answer lies in the answer to the question of why a good God allows suffering. I don't want to duck that question but I don't want to get stuck in it either - simply I want to acknowledge that we live in a fallen world. So God is not a surgeon. But is God a doctor? The word 'doctor' has a couple of meanings - the original is 'wise and learned one.' In that sense of course God is emphatically a doctor; omniscience does give him something of an unfair advantage. More commonly we think of a doctor as a healer. In this sense I also believe that God is a doctor. I believe God is very much about healing. Healing in every sense; physically of course, but moreover and perhaps more importantly emotionally and also most significantly spiritually. And everyone who's a follower of Jesus has a role to play in that. I have no doubt that God heals miraculously and that annoys me - because he doesn't do it very often. Moreover I think it vital that we do not despise or minimise the non-miraculous. Any healing is a manifestation of God's grace. It is my great privilege to be part of that. The healing miracles of Jesus show that healing is indeed something God values and it is making earth just a little more like heaven and in that sense fullfilling the command to be the Kingdom of God on earth. But what about when God doesn't heal? There is, I believe a very dangerous heresy around healing - the 'name it, claim it' theology. Your healing is available to you, if you simply have enough faith. I think this kind of thinking very dangerous and often damaging to vulnerable people. In response to it - to the idea that if you do not experience healing, is is because you don't have enough faith - I say this: Paul. Anyone who's read the New Testament would struggle to conclude he lacked faith - anyone who can write "For me to live is Christ, to die is gain" is someone who has deep faith and understanding of his place in this world and the next. And yet God did not heal him of his thorn-in-the-flesh. Despite Paul's repeated prayers. There are two things to say about this. Firstly, God does not promise to always heal in this life - the fact that godly men and women have died over the past 2000 years suggests to me that more often than not God says "no" to those prayers. Secondly God is not only a doctor but also God. He has a bigger agenda about building his kingdom and glorifying his son. So what about when we see God not healing - what about death? It is always very dangerous to talk to a doctor about death, because we don't like what we can't cure! We cannot cure death - but I do know a man who can! I can offer a pretty good cure for appendicitis but for death... It is important to note that whilst death is inescapably part of God's judgement on a fallen world - the wages of sin is death - it is also paradoxically part of God's grace. For the follower of Jesus, death is release from the suffering of this world and of course so much more - death is the perfect healing! Jesus reveals himself to be the ultimate physician in that he provides the cure for death - in every sense. Jesus the self-sacrificing physician who chose not to heal himself so that you and I might be healed. Is God a doctor? He's the very best. I've had a strong dislike for glibness for a very long time. As with all communication the key is not what is said but what is heard. I think glibness is so dangerous because it is a lie wrapped in a truth. "Smile, Jesus loves you" definitely contains much truth. Jesus loves you more than you can possible imagine and that truth is the source of much joy, but most often when someone says that what they are saying - or rather what is heard is very different. Glibness is this: "Your pain makes me feel uncomfortable so please can you pretend to feel better so I don't have to be uncomfortable..."
Recently I was preparing for a humongous, horrible and highly significant medical-interview. At stake, was my entire career - well future prospects anyway. One of the things one does in this situation is to review one's professional portfolio. In it I have a section - beyond all the publications and professional qualifications on Reflective Practice. This is there, because it is a requirement. Please don't misunderstand me, I think that reflecting on one's practice is vital, continuous and at the core of what we do. It's just that when someone gives me a piece of paper and tells me to "Reflect" I don't find it very helpful. Over my seven years of being a doctor there are a few interesting things I've put in there, often when things have not gone as well as we'd hoped. Learning how to deal with the unavoidable problems in medicine is - well - unavoidable... What really caught my eye though was something, again that was forced, which was a piece of reflective writing we had to do before qualifying. My medical school - as do many - arranged for us to spend two weeks shadowing the doctor we would replace when we started work. This is a vital part of the process; learning where the blood bottles are kept, meeting the ward sister and learning how that particular job works. At the end of this time, we had to write something; this is what I wrote. 7 years on, I'm wondering what I would write now as a 'middle-grade' doctor.